The University of California, Berkeley, faces a key test Thursday night as it hosts Ben Shapiro, a prominent conservative commentator, who’s slated to give a speech at the campus. In preparation, the university and the city of Berkeley are deploying a number of strategies, from counseling to pepper spray, to keep the event from spiraling into another violent confrontation. The birthplace of the free speech movement, Berkeley’s campus has become a battleground this year for showdowns between the radical right and anti-fascists—the most violent confrontation of which happened in February at a protest against a planned speech by conservative media troll Milo Yiannopoulos. 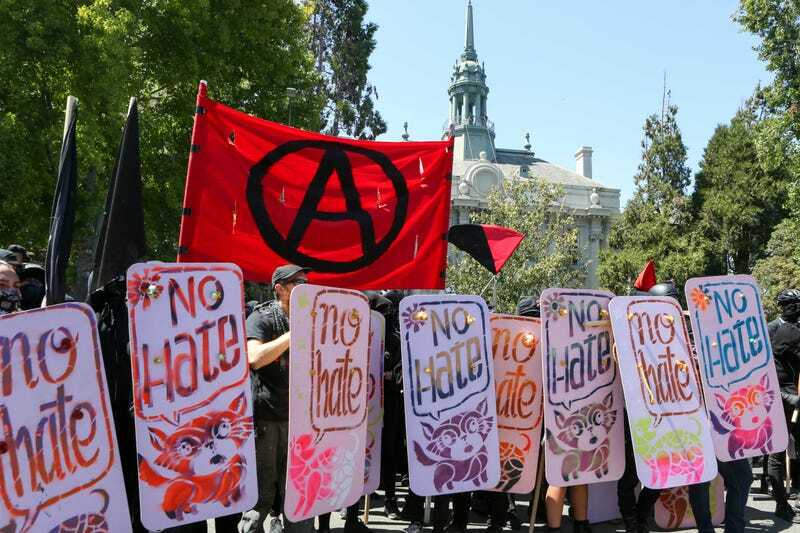 These violent clashes have made the campus particularly attractive to far-right speakers and demonstrators looking to draw attention and stir up the famously liberal community. According to the Washington Post, law enforcement will be out in force Thursday night, and Police Chief Andrew Greenwood promised “very strong, rapid arrests” if protesters show up with weapons or masks. The campus is also shutting down early in anticipation of Shapiro’s speech, and concrete blockades will be erected around the campus. But the real storm is still on the horizon. “Free Speech Week” is slated to run Sept. 23-27 and feature a veritable Monstar team of conservative firebrands and white supremacists, including Yiannopoulos, former White House adviser Steve Bannon and crypt keeper Ann Coulter. The upcoming event is so concerning that some Berkeley faculty have called to boycott classes, the Daily Californian reports. One professor explained that it was unethical and discriminatory for him to ask his black students to come to campus during that week. Earlier this week, Yiannopoulos insisted that he, Bannon and Coulter would all be speaking on the final day of the event. The university, however, has cast doubt on whether the event will continue. According up Politico, administrators say the group putting on Free Speech Week has failed to complete “the critical steps” necessary to host the event.